Jean-Michel Basquiat (1960–1988) was born and raised in Brooklyn, the son of a Haitian-American father and a Puerto Rican mother. At an early age, he showed a precocious talent for drawing, and his mother enrolled him as a Junior Member of the Brooklyn Museum when he was six. 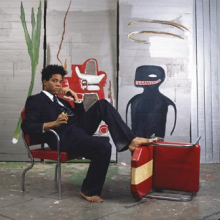 Basquiat first gained notoriety as a teenage graffiti poet and musician. By 1981, at the age of twenty, he had turned from spraying graffiti on the walls of buildings in Lower Manhattan to selling paintings in SoHo galleries, rapidly becoming one of the most accomplished artists of his generation. Astute collectors began buying his art, and his gallery shows sold out. Critics noted the originality of his work, its emotional depth, unique iconography, and formal strengths in color, composition, and drawing. By 1985, he was featured on the cover of The New York Times Magazine as the epitome of the hot, young artist in a booming market. 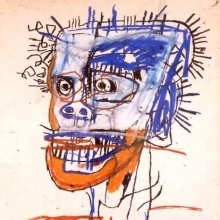 Tragically, Basquiat began using heroin and died of a drug overdose when he was just twenty-seven years old. This exhibition gathers together more than one hundred of Jean-Michel Basquiat’s finest works, including many that have never been shown in the United States. 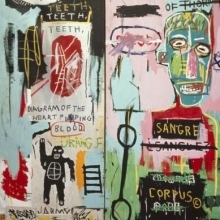 It is organized chronologically, with special sections highlighting Basquiat’s interest in music, language, and Afro-Caribbean imagery, along with his use of techniques such as collage and silkscreen. 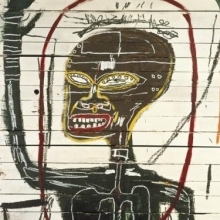 The exhibition seeks to demonstrate not only that Basquiat was a key figure in the 1980s but also that his artistic accomplishments have significance for twentieth-century art as a whole. Basquiat was the last major painter in an idiom that had begun decades earlier in Europe with the imitation of African art by modern artists such as Picasso and Matisse. Inspired by his own heritage, Basquiat both contributed to and transcended the African-influenced modernist idiom. Basquiat is organized by the Brooklyn Museum. Additional generous support has been provided by the Fernwood Art Foundation. The exhibition was also supported by Millennium Partners, The Brooklyn Museum’s Richard and Barbara Debs Exhibition Fund, and the Museum’s Contemporary Art Council. The Federal Council on the Arts and the Humanities has granted an indemnity for this exhibition. The Village Voice and WBGO Jazz 88.3 FM are media sponsors.